I never saw the movie Easter Parade, which was made two years after I was born, but I've always imagined this Irving Berlin song being sung by a man to a woman. The original version was the reverse, it's Judy singing to Fred about his top hat with a fancy pink ribbon for the band. "On the Avenue, Fifth Avenue, the photographers will snap us, and you'll find that you're in the rotogravure." So, what is "the rotogravure"? It's a process developed in the nineteenth century that allowed newspapers to print color photographs and artwork on cheap newsprint paper, using rotary cylinders. 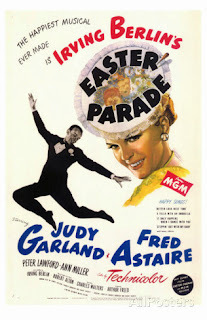 Fred Astaire intended to retire before Easter Parade was made, but agreed to take the male lead when Gene Kelly became unavailable. On my morning walk I spotted this enormous yacht sailing from New York Harbor into the Hudson River. I guessed it must belong to some Russian oligarch, since a couple of other such yachts--see here and here--have recently arrived here. 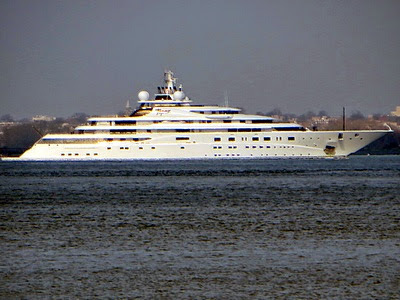 Searching the net, I was able to determine that this yacht is Topaz, which arrived here today from Algeciras, Spain. Topaz, which is one of the world's largest yachts, is of mysterious ownership, although the owner, as reported here, may be His Highness Sheikh Mansour bin Zayed bin Zayed Al Nahyan, Deputy Prime Minister of the United Arab Emirates.